The Hubble Space Telescope (HST) is a space telescope placed 353 miles (569 km) above the surface of Earth. This is done to avoid factors such as the Earth's atmosphere, shifting air pockets, and radiation from obstructing the visual observation of the universe. With the Hubble placed in space, the telescope is above the obstructing atmosphere of the Earth. Taking images now can be done without any background light with all available wavelengths open for viewing. HST's images are extremely sharp and detailed. Hubble's Ultra-Deep Field image, for example, is the most detailed visible light image ever made of the universe's far distant objects. Many of the Hubble Space Telescope's images and observations have led to breakthroughs and advancements in astrophysics, such as accurately determining the rate of expansion of the universe. The space telescope is named after famed astronomer, Edwin Hubble. Hubble is the astronomer credited with the theory of the expanding universe. The HST was built by the National Aeronautics and Space Administration (NASA), with contributions from the European Space Agency (ESA), and is operated by the Space Telescope Science Institute. Two very different galaxies feature in this image taken by the NASA/ESA Hubble Space Telescope, forming a peculiar galaxy pair called Arp 116. Astronomers have long tried to determine whether these two galaxies are actually interacting. Although they overlap as seen from Earth, there is no evidence of new star formation, which would be one of the clearest signs that the two galaxies are indeed interacting. However, recent studies of very detailed Hubble images suggest the onset of some tidal interaction between the two. Two very different galaxies feature in this family portrait taken by the NASA/ESA Hubble Space Telescope, together forming a peculiar galaxy pair called Arp 116. The image shows the dramatic differences in size, structure and colour between spiral and elliptical galaxies. 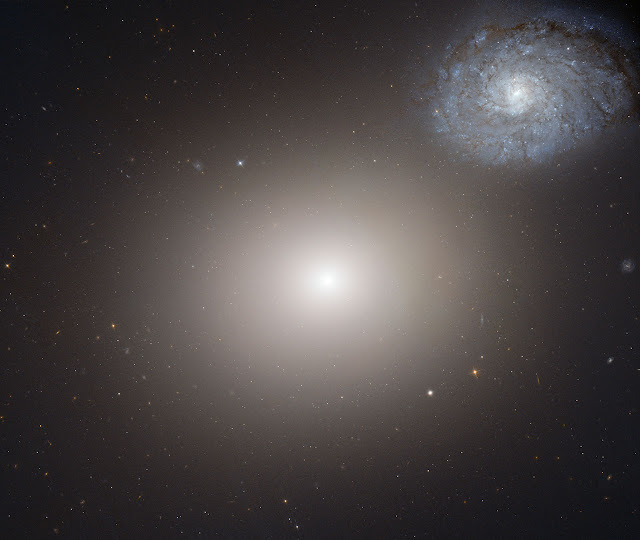 Being a typical elliptical galaxy, Messier 60 on its own may not be very exciting to look at, but together with its adjacent spiral friend, the pair becomes a rather interesting feature in the night sky. Messier 60 is very bright — the third brightest in the Virgo cluster of galaxies, a collection of more than 1300 galaxies. It is noticeably larger than its neighbour, and has a far higher mass of stars. M 60, like other elliptical galaxies, has a golden colour because of the many old, cool and red stars in it. NGC 4647, on the other had, has many young and hot stars that glow blue, giving the galaxy a noticeably different hue. Astronomers have long tried to determine whether these two galaxies are actually interacting. Although they overlap as seen from Earth, there is no clear evidence of vigorous new star formation. In interacting pairs of galaxies, the mutual gravitational pull that the galaxies exert on each other typically disrupts gas clouds, much like tides on Earth are caused by the Moon’s gravity. This disruption can cause gas clouds to collapse, forming a sudden burst of new stars. Although this does not appear to have happened in Arp 116, studies of very detailed Hubble images suggest the onset of some tidal interaction between the two. Regardless of whether they are actually close enough to be interacting, however, the two galaxies are certainly near neighbours. This means we see the two galaxies at the same scale, making Hubble’s family portrait a textbook example of how giant elliptical galaxies differ in size, structure and colour from their smaller spiral brethren. Surprisingly Messier 60 was discovered independently by three different astronomers in 1779. Johann Gottfried Koehler of Dresden first spotted it on 11 April that year while observing a comet, the Italian Barnabus Oriani noticed it a day later, and the French Charles Messier saw it on 15 April. Charles Messier then listed the galaxy in the Messier Catalogue. Having photographed the galaxy pair with the 5-metre Hale telescope, US astronomer Halton Arp included it in his Atlas of Peculiar Galaxies, published in 1966. The catalogue contains images of 338 “peculiar galaxies” — merging, overlapping and interacting galaxies.